Three shimmering old mine cut diamonds in bezel settings float within a beautiful milgrain-embellished platinum setting in this Art Deco ring. 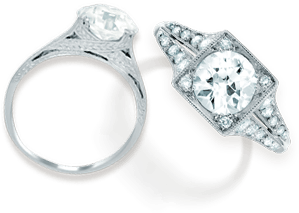 Fourteen sparkling diamond accents highlight the center gems, and the ring shank is made of lustrous yellow gold (approx. 0.62 total carat weight).